An intensive 3-day workshop produced by Invisible Ph t grapher Asia, tutored by David Gibson, one of the founder members of In-Public, for anyone interested in photography and particularly street photography. It is for both amateurs and more advanced photographers but it is hoped that certain names such as Henri Carter-Bresson, Garry Winogrand or Alex Webb – or even those within in-public – might already have some meaning for those interested in attending. Establish what street photography is. Offer inspiration by looking at some of the great street photographs from the so-called masters to the lesser-known photographers. Interpret these street photographs and thereby offer a tangible approach to participants where they might practice their own photography more fully. Stimulate debate about street photography and the issues around it. Encourage participants to develop a more critical sense about their photography and a better ability to edit their work. Understand the importance of themes and projects. Provide an impetus to participants to continue to take street photographs after the workshops. Payment can also be made in cash at the IPA Gallery. The opening session will essentially be crammed with looking at meaningful street photographs – with lots of questions and debate. David will introduce the workshop by showing an eclectic mix of street photography from the 1930’s onwards, including those from Masters and lesser-known photographers whose work has particular inspired David. David will then show a selection of his own street photography, which covers nearly 25 years. This will be firstly his black and white photographs and then his more recent colour work. David will highlight the importance of projects, and offer some suggestions to participants, one of which will be the set assignment for the workshop. The afternoon will be spent taking photographs with David on the streets of Singapore. The overriding aim of the day – as established in the opening sessions – is to prime participants to take better street photographs. The essence of street photography is to wander with a curious eye and as David frequently asserts, “to look for the luck”. David will be on hand to offer suggestions, encouragement and in camera feedback. The bulk of the final session will be a thorough examination of participant’s work with an emphasis on the photographs taken on the previous day – which will include the set assignment. Participants are encouraged to bring along any previous work too. In addition during the 3 days there will be short one-to-one sessions timetabled where David will specifically look at participant’s work, either on a laptop or by reviewing prints. 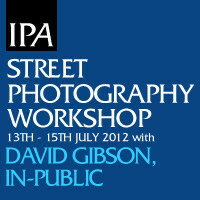 Your chance to learn street photography from David Gibson, from the renowned IN-PUBLIC Collective. 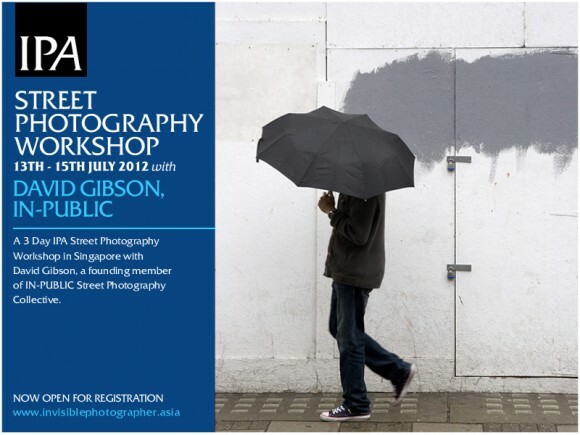 RT @Jpncamerahunter: @InvisPhotogAsia: Your chance to learn street photography from David Gibson, IN-PUBLIC Collective.